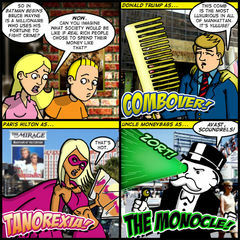 After drawing today’s comic, I sat and wondered just how effective Donald Trump would be as a super hero? My guess? Not very. First thing’s first. I want to let everyone know about the art auction I currently have running over at eBay. Click here to see the auction listing. Here’s an image of the artwork. It is a rendering of Tom cast as Anakin Skywalker as he appeared through all three Star Wars prequels. 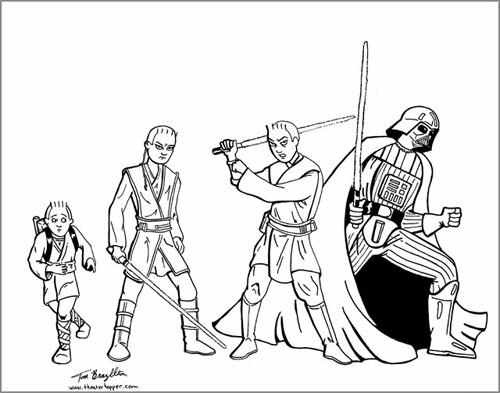 From his days as a snot-nosed brat on Tatooine, through his pouty teenage-years, into his mulleted twenties and onto the grim visage of evil – Darth Vader. The art is a one-of-a-kind original, done in pencil and finished in ink on a sheet of 11″ x 14″ Bristol board. The winning bidder will have the art shipped to their residence in a re-enforced cardboard shipping tube to prevent creases, bends or folds. This artwork was something I originally intended on auctioning off last month to coincide with the release of Star Wars: Episode III – Revenge of the Sith. But those plans got sidetracked and I’m auctioning it off now. Better late than never, right? I plan on following up this auction very soon with a piece inspired by Batman Begins. So if you don’t win this auction, look for the next one to come down the pike in the next week or so. As previously mentioned above, people who have signed up for the Theater Hopper mailing list were tipped off early to the auction last night. In fact, I let them know as soon as I posted it to eBay and there has already been a handful of bids. You don’t want to be left out of the loop for next time, do you? Sign up for the mailing list today and be the first to know about auctions, new merchandise and possibly be given the opportunity to cash in on discounts for advertising and stuff in the store! It takes literally seconds and you’ll only be getting e-mails from me. We do not sell your information to anyone else! Regarding the comic, I really wanted to do something closer in the spirit of the new Batman movie opening today, but when I sat down to conjure something up, the idea of the wealthy transforming their lives to become super heroes just stuck in my brain. Paris Hilton as “Tanorexia,” specifically. The only way to get it out was to put pen to paper. Incidentally, this isn’t the first time Uncle Moneybags has appeared in the comic. Enjoy him in his utter 1920’s carpet bagging glory in these two strips from the archive. When you stop to think about it, Bruce Wayne did a pretty amazing thing taking his family’s fortune and using it to avenge his parents murder. Whenever I think of a spoiled rich kid from the East Coast, I’m thinking of some coked-out yuppie yachting with his blue-blood girlfriend Mitzy. Most people don’t have the drive or determination to use their resources to become better than what they are. I have high hopes for the new Batman film. It’s been getting positive reviews out the wazoo. But it doesn’t look like I’ll be able to go to the theater any time soon. Cami is getting her Master’s degree and started her summer semester this week. She’s taking an accelerated course, so she’s in class tonight and almost every day this week. Even Saturday! Of course Sunday is Father’s Day, but(unfortunately) my Dad isn’t into these kind of geek-fest cinema offerings. Oh, man! When I have kids, they’re gonna pay on Father’s Day. Well, if you’re here, then that means you’re interested to see how thing resolved themselves from Monday’s lack of comic. And if you’re interested, you have my thanks. Basically there was a small coding snafu that prevented the site from loading in Firefox. And instead of posting the comic where only a portion of the audience could see it, I decided to hold off until the problem was resolved so that EVERYONE can see it. But now we’re in the clear and we’re ready to have a good time! My only regret is that we missed out on sharing our 500 comic extravaganza with Jeph over at Questionable Content who also reached the same milestone on Monday. Spooky, huh? It’s like we’re conjoined twins, seperated at birth! Congrats to Jeph! Can you believe that there are 500 of these bad boys in the archive? I can’t. Too bad comic Tom can’t celebrate with us. He’s too busy getting his mug shot taken. AGAIN! I thought it was appropriate to tackle a pasttime not often discussed here at this site that shares it’s namesake – theater hopping. Staring down a blank piece of paper, trying to think of something for this momentous occassion, I took a step back and said "What’s the one thing these characters have never done?" And then it hit me like a ton of brick. But look where it got them? Remember, kids – crime doesn’t pay. Thinking about 500 comics has put me in a reflective mood. I think it’s certainly a greater achievement than being around for 3 years. But maybe since that took place in August and this milestone is taking place at the end of the year when I’m already taking stock of how 2005 treated me, it seems more poigniant. I know for certain that I wouldn’t have gotten here without the help of good people. To Michael for helping to get the THorum on it’s feet. To Brian for his help with the hosting. To Carrington, Zach and Mitch whose feedback and friendship I so deeply respect. To each and every one of you who took the time to write and e-mail of encouragement. To anyone who bought a t-shirt or a poster to show your support for the comic. To all of you who come to the site for a quick laugh before going about your daily chores. Doing Theater Hopper has been one of the most fulfilling creative endeavors I’ve ever undertook. The fact that you guys appreciate it and continue to support me means more than you’ll ever know. I appreciate you guys a whole heck of a lot. Someone new that I have to add to the list of life-savers is my good friend Dave. Y’see, Dave created something for the site that I think all of you are going to find very useful. He made the archive searchable. Don’t ask me how he did it. I’m sure it involved some kind of voodoo sacrafice. But the fact of the matter is that you can now search our entire archive of 500 comics, plus every guest comic along the way either using random keywords or by typing in the title (or even part of the title) for the comic you want to see! Dave thought of everything. Not only did he make the archive searchable, but he reconfigured the archive display so it breaks out by year and by month. You can see EXACTLY what days I updated for March of 2003 if you wanted to. Extra bonus? 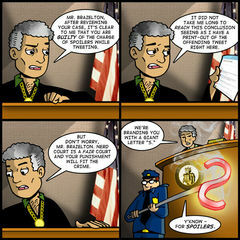 Roll your mouse over any one of the links and and ALT tag appears letting you know the title of the comic! How cool is that?! Even cooler is that Dave was able to use a color-change identifier to let you know which of the comics were penned by yours truly and which are guest comics. This is something I’ve wanted for the longest time. A way to recognize other artist’s contributions to the site. Dave found the perfect visual shorthand. Oh, and another thing about the guest comics? They’ve all been added back into the archive. So those that were missing for a while are now placed back on the site in proper chronological order for you to enjoy all over again! I will point out a small downside to this revision. If you are a web master and you’re linking to a specific comic in the archive, the links of the indivdual comic pages have changed. Whereas before comic URLs were generated by the number of the comic in the archive, things are now built by the comic’s publication date. So check your links if you have a site. I’d hate for you guys to miss what you’re trying to show others! I’m thinking specifically about the guest strip artists who may have linked to their work in our archive. But, hey! Is that so bad? A pretty small price to pay for such a leap in functionality, wouldn’t you say? And what’s growth without a little struggle. "How could there possibly be more?!" I know you are asking this to yourself. Well, it’s possible. Pleanty possible. Dave created something that is going to increase the user interactivity level on this site into the ozone. Dave created a reviews section… where you, the user, can leave reviews of every movie Theater Hopper discusses! Okay. I know. CALM DOWN! IT"LL BE ALL RIGHT! The way it works is deceptively simple. First, follow this link to the reviews archive. From there, use the search perameters to find the film you want to discuss. For example, Austin Powers in Goldmember. Now let’s say you want to leave a review of the movie. So simple! See that little link that says "Add Review?" Click it! At this point, it’s going to ask for a username and login. Don’t be psyched out! If you don’t have one, you can easily get one here. Y’see, Dave is such a genius, he tied the reviews database in with the THorum database! That means that they share the same login information! That also means that if you already have a THorum account, you’re ready to go right off the bat! Now does getting a reviews account mean that you have to start posting in the THorum? Hey, we’d love to have you! But you’re not obligated. This is simply a way for us to keep tabs on what is being posted to the reviews database and to do a little pruning if this get out of hand, you know what I mean? Obviously we don’t want any naughty language creeping into your reviews, so please be courtesy when you leave your thoughts for everyone to read. In fact, don’t write anything you wouldn’t want your Mom to read. And if you happen to have a very hip and liberal Mom, don’t write anything you wouldn’t want your baby sister to read. She has very sensitive ears. Anyway, once you’re logged in, rate the movie from 1 to 10. After that, feel free to type up your review! After a while, we’ll have a database FULL of reviews all authored by you – the audience! Don’t agree with my thoughts on a recent film? This is your chance to set the record straight. Wanna leave behind your thoughts as to why Weekend at Bernies is the best modern American comedy? Now’s your chance! The beautiful thing about these movie review listings? Each one of them is tied back to the comic in the archive that references them. IT’S ALL CROSS-FUNCTIONAL, I TELL YOU! IT’S MAGIC! Understandably, we don’t have EVERY SINGLE MOVIE in the reviews database that has been referenced in the comic. But there are a handful and we’re working to add new ones all the time. If there’s a comic that discusses a particular movie and a review page hasn’t been created for it, e-mail me and I’ll get right on it! I want this to be a truly interactive initiative. I want you guys to feel like you have a larger role in the community aspect of this site! This is a lot to soak in, I know. But let the information settle. Once you’re done with that, test out the archive! Test out the reviews database! Take these bad boys for a spin! They’re here for your benefit! Thanks again to Dave for all his hard work and for putting up with my general ignorance. Dave has a great comic called Taking the Bi-Pass that everyone should check out and add to their regular reads as a reward for his hard work. In the meantime, keep your eyes peeled for ANOTHER announcement later in the day that I’m not prepared to let out of the bag just yet! But it will be a lot of fun and I think you guys will like it. THANK YOU TO EVERYONE THAT MAKES THEATER HOPPER A SUCCESS. THANK YOU!